Judging by shows on DIY Network and HGTV, it takes approximately 24 minutes to renovate a house. We all know this is not true. But this style of fast-shot remodeling presided over by glib hosts takes away from the core notion that home renovation is complex and difficult and real. Following is the approximate process for whole-house renovation. A sketch on a cocktail napkin, full-blown architectural plans, or just a firm set of thoughts about how the remodel should progress. 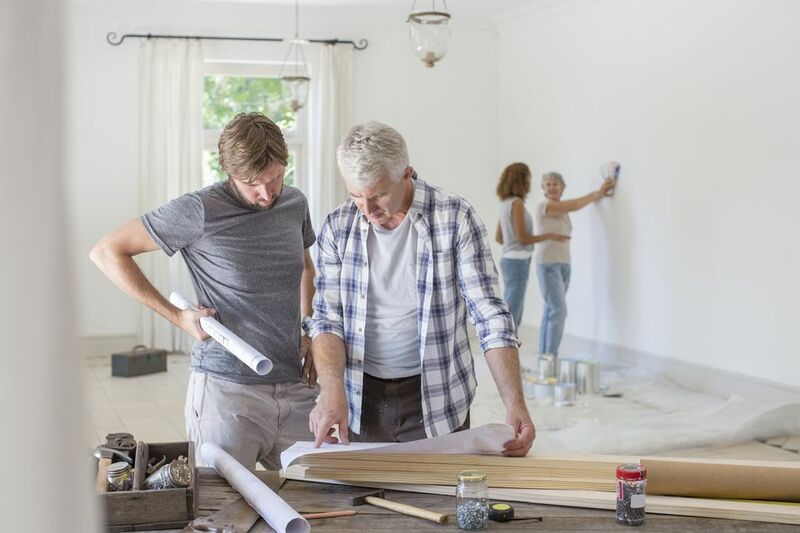 It is cheaper and less frustrating to correct mistakes before the remodel takes physical form.Ensure that you have funding for your renovation. Roof replacement or repair; foundation fix; stopping water infiltration; installing or repairing siding and windows. Large projects must be done first because subsequent projects are impacted by them. Make major foundation repairs to areas such as weakened walls, joists, and carrying beams. Demolishing and disposing of sections of the house that will be replaced by later projects. Carpentry that is in support of other work such as drywall, new or moved walls, windows, doors, etc. Significantly enlarging the window openings. Vital services that need to be installed when the walls and ceiling are open. With the walls and ceiling open, it is time for the HVAC company to install ductwork for central heating and air conditioning. Run new electrical and plumbing systems. Electrical and plumbing inspectors will visit at this time, too. Laying the insulation in the walls and ceiling. Install fiberglass insulation in the walls and attic. Insulation goes fast, so make sure that your drywall company is ready to go soon after this. Closing up the walls with drywall: hanging it, mudding it, and sanding it. Installing new-construction or replacement windows. Window installation, whether whole-house or partial, almost always plays into a home remodel project. Carpentry that is not supportive: baseboards, molding, trim around windows and doors, built-in elements (bookcases, breakfast nooks, etc.). Fine carpenters give your house that finished touch. Painting interior walls, hanging wallpaper, painting molding and trim, staining and sealing trim. All of these detail-oriented surface finishes should be one of the last items you do indoors as this work can damage other work of yours. Should you paint before installing or sanding your flooring or the reverse? This is debatable. Laying flooring first means that paint might get on the flooring. Painting first means that the floor sander may scuff your walls. Your final floor covering--laminate, solid hardwood, tile, engineered wood. Installing the flooring as late as possible in the renovation process saves your flooring surface from significant damage. Exterior work on the outside of the house. With the house mostly finished, it is safe to put on the siding. You do not want to do this earlier (unless absolutely necessary) because doors and windows may get punched out, ruining the siding. Any buildings that are detached from the main house.